If you follow this site at all, you have probably figured out that there are many different ways to brew a good cup of coffee. Coffee lovers enjoy debating about which method is the best almost as much as they love coffee. But if there is one thing that is consistent across all the brewing methods, it’s that for a good cup of coffee you need hot water. Perfectly heated water is almost as important as the beans you use. Don’t Feel Like Reading? 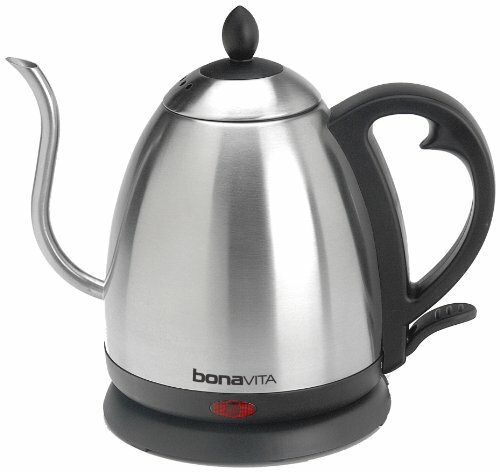 You can’t go wrong with the Bonavita Electric Kettle. Click here to check it out on Amazon. 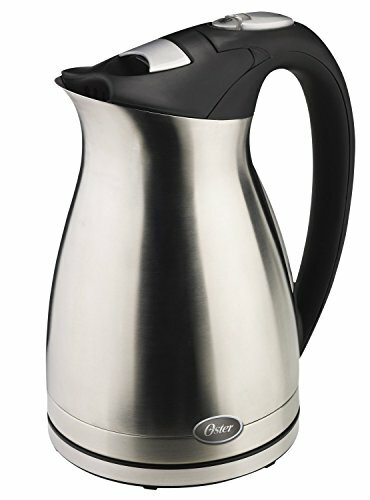 One of the best ways you can heat your water, is by using a hot water kettle. 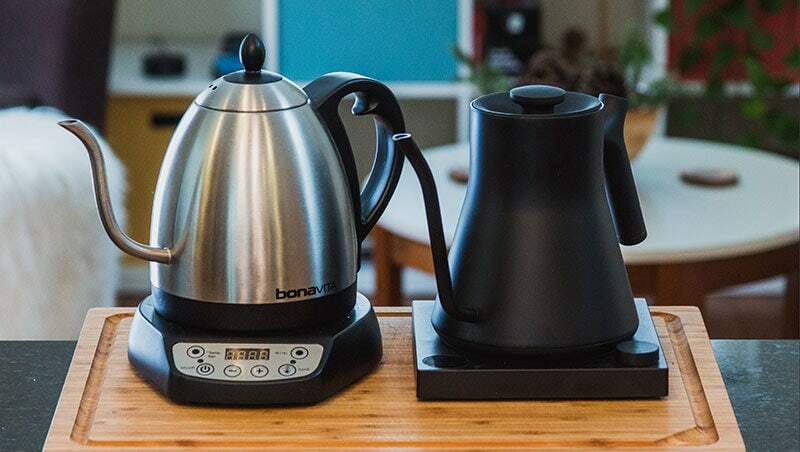 Today, we decided to take a look at some of the best hot water kettles that you can use to heat your water and keep it at the perfect temperature so you can brew one fine cup of coffee. 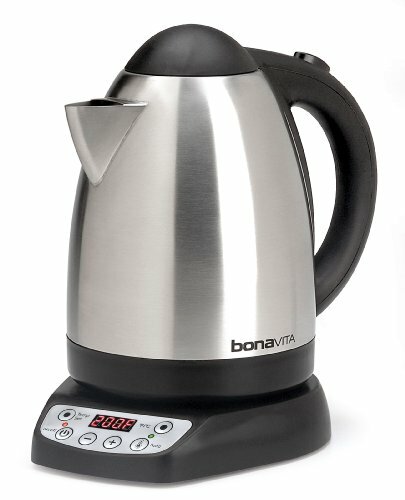 The Bonavita Electric Gooseneck Kettle features a brushed stainless steel design with a gooseneck spout for better pour control. If you need your water hot and fast this kettle features a 1000 watt heater for quick heating of your water to the perfect temperature for your coffee. Ovente KS88S comes in a variety of looks from traditional stainless steel to a red finish making it a great addition to any kitchen. It’s 1100 watt heater can heat water fast and is up to 85 percent more efficient than a traditional stove top kettle. If you need to keep your water warm for multiple cups throughout your morning, this kettle can keep your water at the perfect temperature for up to 2 hours so you have plenty of time to make your cup of coffee. The Cuisinart CPK-17 brings modern design to a classic kettle with its backlit water window that allows you to see exactly how much water is in your kettle at all times. It features a 1500 watt heater that will heat your water in no time flat and even comes with six different pre-selected heat choices so you can choose the temperature of your water. Once warmed, it can keep your water at the perfect temperature for 30 minutes which, while not a lot of time, it is more than enough to make more than one cup of coffee. Do you travel a lot but you still want to make a good cup of coffee? 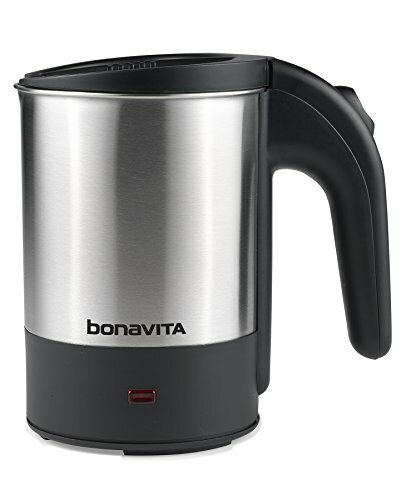 The Bonavita Travel Electric Kettle will keep you from ever having to worry about hotel coffee makers ever again. While it won’t hold a lot of water, it is designed to easily fit into your suitcase so you can make a cup or two of coffee while you travel with ease. It features a 700 watt heating element and includes auto shutoff so you don’t have to worry about turning it off when you head out of your room for the day. If you are worried about accidentally burning yourself on your kettle, the Oster 5965 takes care of that problem for you. It features a concealed heating element and a stay-cool handle so you don’t ever have to worry about being burned ever again. The stainless steel design looks great in any kitchen and it even features an auto shutoff feature so you don’t have to worry about remembering to turn it off before you leave the house. Sometimes you need to kick it old school. 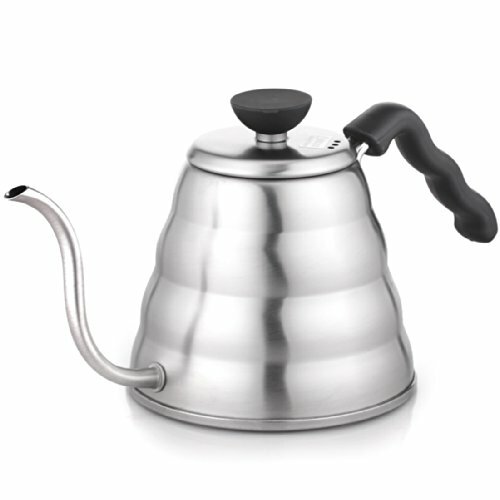 The Hario V60 is a classic stove top kettle with a classic design that is both elegant as well as functional. It can be placed directly on top of virtually any stove so you can heat your water the old fashioned way. If you prefer to do things the way your parents and grandparents did them, then this kettle will be perfect for you. If you prefer to prepare your water the night before, the Hamilton Beach 40996 includes a programmable clock that allows you to set when your water will be heated. 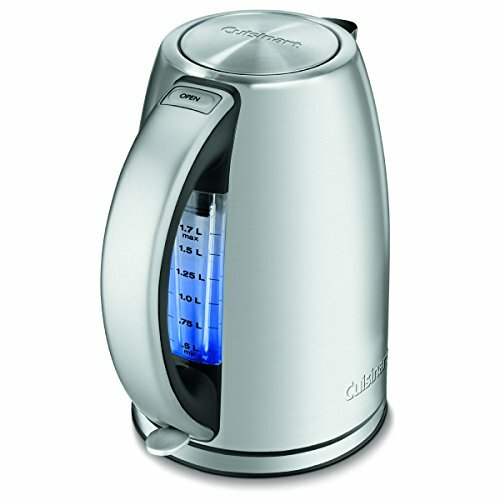 It includes 5 different temperature settings so you can use this kettle for both tea and coffee. Once your water is heated, it can maintain your water temperature for one hour before it shuts off. If you are looking for an easy to use kettle that has all the modern features that you would expect today, the Hamilton Beach 40996 is the kettle for you. Another classic stove top kettle, the Mr. Coffee 91407.02 is a classic whistling kettle that will heat your water perfectly on a stove. Featuring a satin finished design, this kettle sports a classic look that any stove top kettle lover will want. While this kettle isn’t oven safe, it will work on most stove tops so you can easily heat your water no matter what type of stove you have installed in your kitchen. The last classic stove top kettle we’ve included on this list, the Medelco kettle replaces the stainless or satin finished steel design and replaces it with glass. 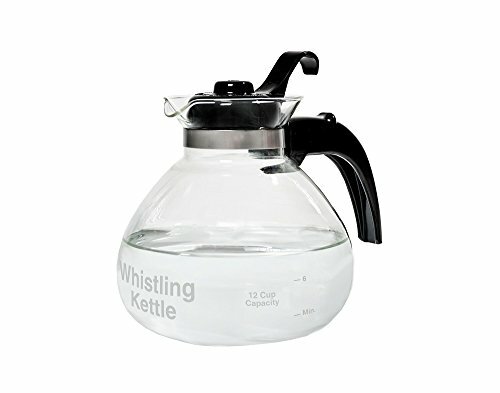 Like other classic kettles, it features the whistle that will let you know when your water is the perfect temperature. On top of that, you can watch it boil (if that’s your thing) through the crystal clear glass that is designed to be perfectly safe on your stove. The Ovente KP72W is designed to bring a little color to your kitchen with its many different color options. 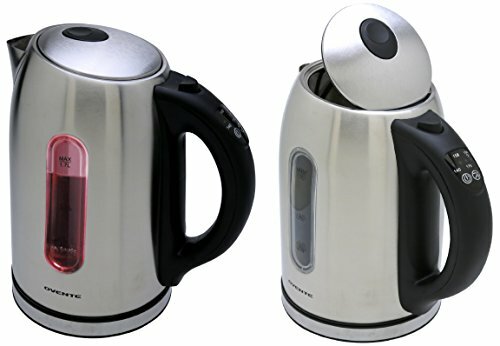 You can have this kettle in white, purple, brown and more. No matter how you have designed your kitchen, chances are you can find one of these kettles to match. But, forget about looks. 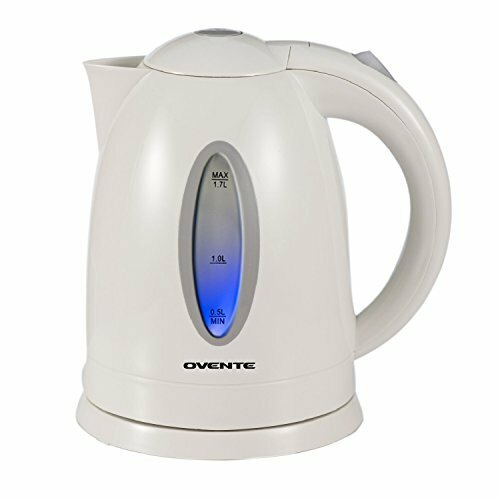 The Ovente features an 1100 watt heater that will heat your water quickly and evenly, and the element is concealed for maximum safety. 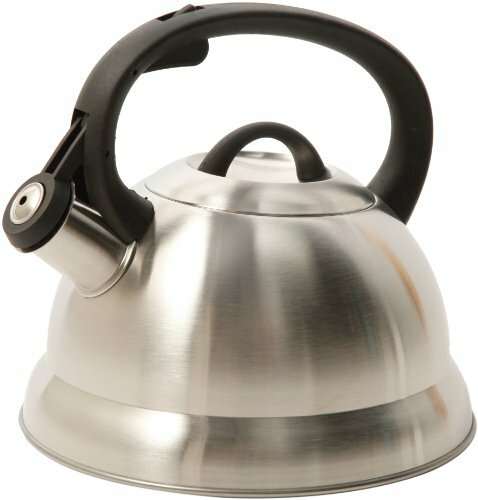 This is also one of the most affordable electric kettles on this list, making it the perfect kettle for anyone shopping on a budget. Remember, one of the main ingredients in any good cup of coffee is hot water. Without it, you simply cannot enjoy many of the best flavors and nuances you will find in each cup of coffee. Using any one of these hot water kettles will help you make sure that you have water that is the perfect temperature every time. That way you know that the next cup of coffee you make will simply be spectacular.